Heat the broth, apples and onion in a 3-quart saucepan over medium-high heat to a boil. Reduce the heat to low. Cover and cook for 5 minutes or until the onion is tender. Remove the saucepan from the heat. Add the stuffing and mix lightly. Heat the stock, cider, brown sugar and mustard in a 2-quart saucepan over medium-high heat to a boil. Reduce the heat to medium. Cook for 8 minutes or until the glaze is reduced by one-third. Remove the package of giblets and neck from the turkey cavity. 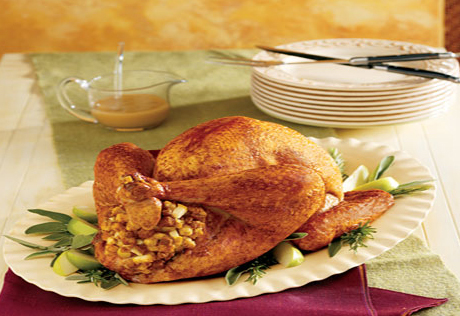 Rinse the turkey with cold water and pat dry with a paper towel. Spoon the stuffing mixture lightly into the neck and body cavities. Fold the loose skin over the stuffing mixture. Tie the ends of the drumsticks together. Place the turkey, breast-side up, on a rack in a large roasting pan. Brush the turkey with the oil. Insert a meat thermometer into the thickest part of the meat, not touching the bone. Roast the turkey at 325°F. for 4 1/2 hours or until the thermometer reads 165°F., basting occasionally with the glaze. Begin checking for doneness after 4 hours of roasting time. Remove the turkey from the pan and let stand for 10 minutes before slicing. Skim off any fat from the pan drippings. Stir the gravy into the roasting pan and cook over medium heat until the mixture is hot and bubbling, stirring occasionally. Serve the gravy with the turkey and stuffing. Helper: Bake any remaining stuffing mixture in a covered casserole with the turkey for the last 30 minutes of the roasting time or until the stuffing mixture is hot. Use an instant-read thermometer to check that the center of the stuffing mixture both in the turkey and in the casserole reaches 165°F.